The Sheriff’s Office is responsible for all enforcement operations and includes sections which perform the functions of patrol and traffic enforcement, investigations, animal control, evidence storage, training, crime prevention, and law-related education. 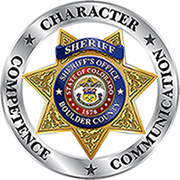 The Sheriff’s Office strives for excellence in delivering law enforcement services to Boulder County communities by ensuring appropriate staffing, training, and assignment of personnel. We also strive to instill the concepts of “crime prevention” and “problem solving” as everyday work values in all our personnel. We respond pro-actively to anticipated public safety problems through continued use of our assigned district plan and “community policing” philosophy and attitude. We stress the concepts of innovation, community participation, problem solving, continued assessment, and evaluation of our efforts as we endeavor to be effective in our day-to-day service delivery.